Every Day A Different Adventure! Join us for six days on the trail. The terrain is varied, comprised of slot canyons, river banks, cattle trails, and paths in the high lonesome. We will ride in and around, Zion National Park, Bryce Canyon National Park, The Paria Box in the Grand Staircase-Escalante National Monument, and the 7th wonder of the world The North Rim of the Grand Canyon. Your ride in each of these areas will take you to places that most people never see. We will pick you up in Las Vegas, Nevada and have a three-hour trip to Zion National Park. Your wrangles will meet you at the Zion trail head for a ride in the grandeur of Zion National Park. 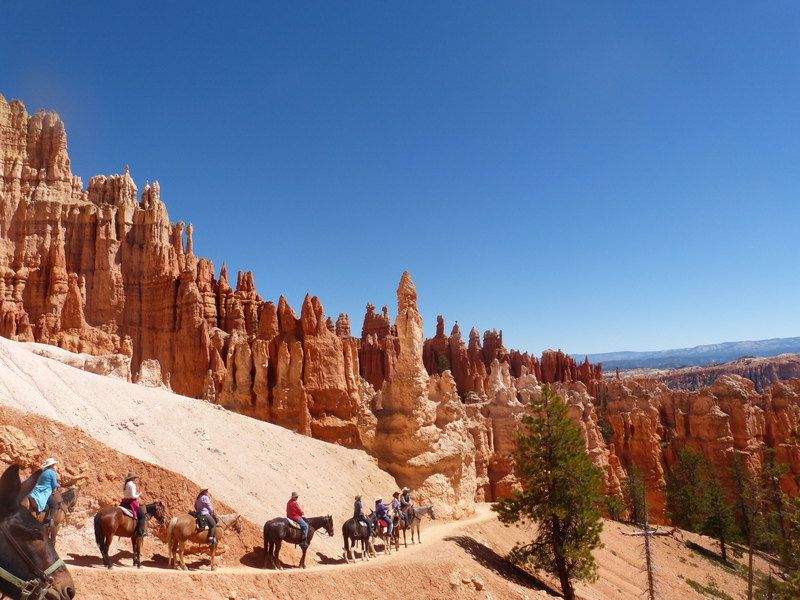 Bryce Canyon… bring your boots! See the red, pink and orange colors of the intricately eroded limestone "hoodoos" that are constantly changing with the movement of the sun, making the magical landscape come alive. Ride the trail along the ridges of Red Canyon, (Bryce Canyons little brother) viewing the vermillion-colored rock formations dotted with trees, through the Dixie National Forest to the head of Red Canyon. Ride the trail Butch used to escape Panguitch Town Sheriff Haycock, after a bar room fight in Panguitch, Utah. This trail winds up a red rock draw up to the flat lands and back down Casto Canyon. This spectacular 30 mile ride takes you down the Box of the Paria. Outlaws, famous rustlers, cowboys knew about it's secret passages decades ago. Sites of Indian petroglyphs and other historic relic's makes you feel like you were in the "Old West". Your trip to the Grand Canyon will have you enjoying the Grand Canyon Lodge and the view points in the morning. Departure at the North Kaibab Trail on the day ride down the Supai Tunnel, and back to the North Rim Corral.